IoT engineers need the ability to think at a systems level, and acquire cross-domain skills across engineering, business and application sectors. The main technical skill domains for IoT can be simplified to sensors and embedded systems, data analytics and integration, security, and IoT platform interoperability. To commercialise IoT solutions through startups or other commercial structures, business planning and innovation skills are also important. Having skills that span business engineering and multiple application areas can be very useful for IoT engineers, business people and other professionals. For example, being able to conceptualise how IoT systems can be applied to the needs of specific industries, or used to address cross-industry issues such as climate change or mobility. 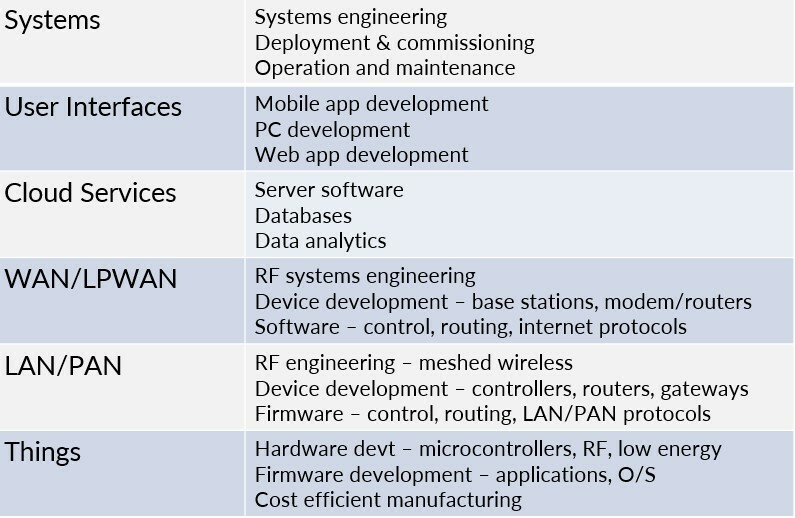 As the IoT uses similar technologies to address the needs of multiple industries and cross-industry applications, it is likely that as IoT uptake grows, the demand for IoT professionals will fall at the intersection of engineering, business and domain skill sets as shown in the diagram below. Diagram courtesy of Frank Zeichner, University of Technology Sydney. Another reason to expand skills beyond the technical domain is the need to understand the market context of IoT solutions in particular application industries. For example when designing the physical nature of Things and their required data analytics, IoT professionals need to understand why the Things have been deployed, where they are deployed and their value to the owner. The IoT Alliance Australia has done some work in mapping skills to IoT roles. A summary of the skills mix for some key roles for IoT engineers and business professionals is shown in the diagram below. Many of these skill levels are yet to be attained. For example, board members’ knowledge of IoT data security and how it relates to risk management is typically quite low. It is also a challenge to up-skill staff while maintaining business as usual. Formal education and skills development for IoT is in its very early days. The IoT is a complex ecosystem of technologies, sensing, actuating, communications applications and services, visualisation, security and operating systems. While academic courses for individual technical elements are plentiful, not many cover all or most of these areas, as well as incorporating business skills and domain specific learning. 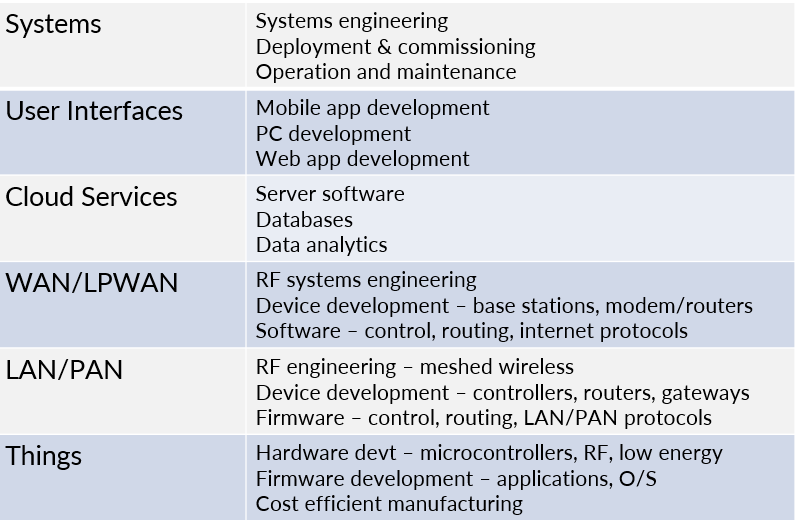 A non-exhaustive list of Australian courses that cover some IoT skills areas are shown in the table below. Accrediting bodies within Australia for the development of IoT education courses are shown in the following table. The emerging model for tertiary education in IoT is shorter, more focused units, and there is also a key role to be played by skill-based learning in the VET sector. It is likely that these two sectors will overlap for IoT education. There is also considerable industry involvement in developing courses to give IoT professionals the skills that they will need in the workforce. Because the IoT is changing the models of how we collect, share, analyse and interpret data, much IoT skill development will be gained through trialling and piloting solutions in real world contexts, which can then be recorded and eventually passed on through formal education. Educational institutions are also starting to embed industry and application specific practical exercises in their courses, to allow graduates to be more ready to conceptualise and solve problems in practical and business contexts. Engineers wishing to enter the field of IOT have a number learning curves they need to go up in order to become fully competent. The diagram lists general areas where learning curves must be tackled, with just a few examples are relevant to those particular areas in the right hand column. At the systems level, IOT involves quite complex systems, so we need to conceptualize, visualize and specify what those systems must be. A business case must be developed that make sense and convinces those controlling the purse strings that there's a benefit or money to be made. If accepted, we then need to implement it. Because of the cross-disciplinary skills required, for most parties, this will mean finding experts who can assist them in the process. User interfaces present their challenges in that you have to decide what platform, what the user interface will look like. What are the design approaches to reducing the complexity experienced by the user? Then of course we have the design skills required to implement user interfaces on platforms such as iOS and Android and mobile devices, and web browsers. A thick client is a client application running on the end platform that providers a higher level of capability than a simple web browser. In terms of cloud services, we need to select a platform, establish and then operate the services on that platform. The virtual servers running in the cloud typically are hosting the database and big data analytics are applied over this, feeding back into the user interface. In terms of connectivity, we have wide area networks and low-powered wide area networks emerging, and then local area networks and personal area networks. Collectively, these provide connectivity between the cloud services and user interfaces, and the databases, down to the deployed things. This is hierarchy is typical. LTE stands for long-term evolution of cellular data and cellular telephony. 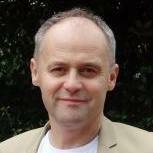 3G, 4G, 5G, and emerging Narrowband IoT. There are also standalone systems separate from the telecommunications network, providing wide area connectivity for extremely low-power devices at low cost. e.g. Sigfox, LORA, Ingenu and Taggle. Local area networks and personal area networks, there are ones that people will be familiar with. Typically Bluetooth and perhaps USB and WiFi and Ethernet. Cable-based connection systems still play their part, so Ethernet, RS-485 and CAN bus, and wireless mesh networks. Zigbee, people may be familiar with, but the 6LoWPAN, which is an open source equivalent of that, providing meshed wireless connectivity down at the premises or deploy site level. Things are the devices themselves. Challenges exist in this area because a thing consists not only of the electronics and firmware to undertake the core function of the device, but also the elements required to provide connectivity. A developer in this space may be familiar with what he needs to do to control the device or interface with the system down at the deployed equipment level, but achieving connectivity back up the chain to the rest of the Internet of Things may be an additional challenge outside of a core skillset that then requires additional expertise. For student engineers and recent graduates, the Internet of Things will provide a rewarding career paths and there are plenty of opportunities for more experienced professionals. The slide below outlines career paths from the perspective of ICT, electronics and software professionals, and considers emerging and evolving technologies where new skill sets will have to proliferate through the engineering community. There are parallel skill sets to be learned, particularly how to apply the technologies at the system level in the systems that the engineers are developing and deploying. Also, how to interface with the service providers in the space, which is going to be a significant challenge and calls for a lot of collaboration.